The Salish Sea is an intricate network of coastal waterways in the Pacific Northwest that includes the Olympic Peninsula of Washington and Vancouver Island in British Columbia, Canada. 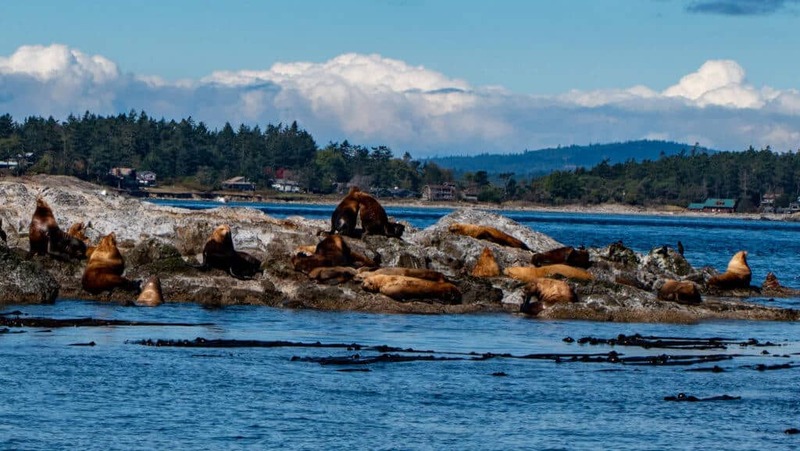 The area is famous for attracting a huge variety of sea mammals, including transient and resident orcas, humpbacks, gray whales, minke whales, porpoises, sea lions, and seals. 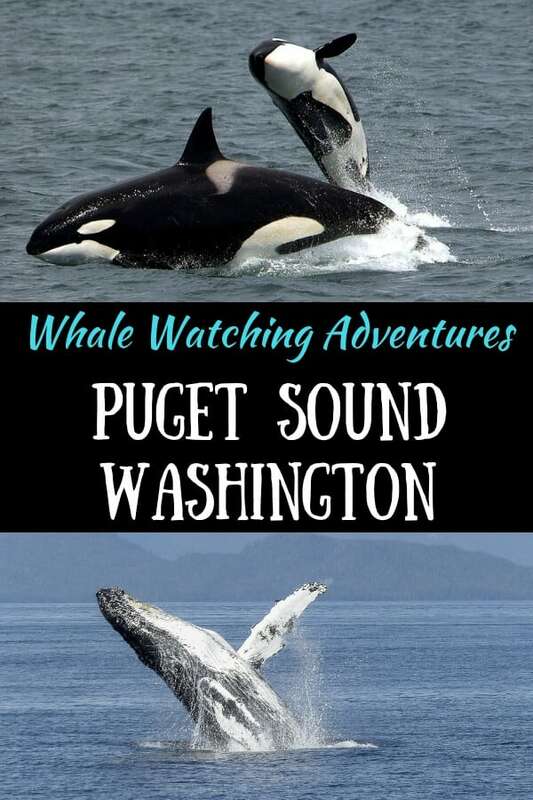 Orca watching in the Salish Sea has been on my bucket list for my whole life, and since I recently visited Port Townsend for my son’s graduation, I jumped at the chance to embark on a Puget Sound whale watching tour with Puget Sound Express. They’ve been offering wildlife excursions in the Salish Sea for more than 40 years! This is Mike (J26), a Southern Resident Orca that we saw on our trip. There is a huge variety of marine life in the Puget Sound and Salish Sea, but the most exciting encounters are with orca and humpback whales. They are magnificent animals, even personable, and the Puget Sound Express naturalists know many of them by name. 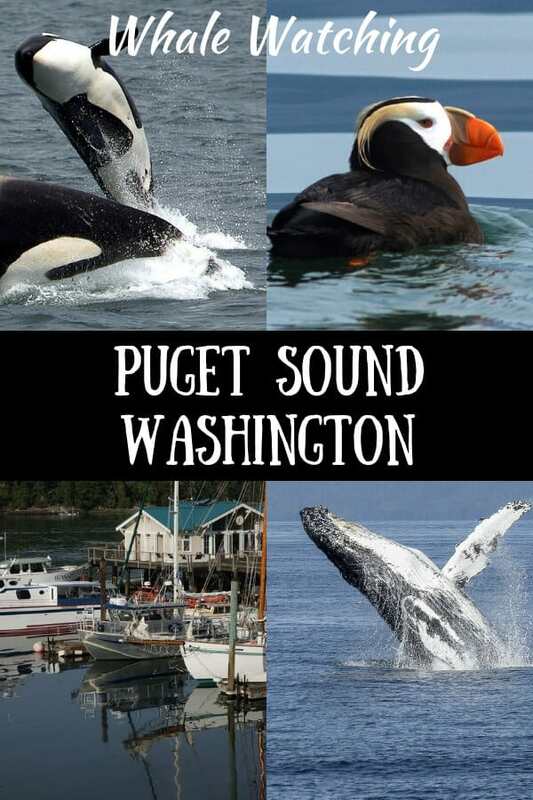 Here’s a brief overview of the whales you can expect to see on a Puget Sound whale watching excursion. The Southern Resident Orcas are made up of three pods, J, K, and L, who inhabit the Salish Sea year-round. The pods are further divided into sub-pods centered around older females. Unlike transient killer whales, the Southern Residents eat mostly salmon, and each pod uses a unique dialect of calls that is not used by other orca communities. Because the salmon numbers are dwindling in the Salish Sea, the Southern Resident Orcas are listed as endangered by the U.S. Fish & Wildlife Service. J Pod is the most commonly seen in the Puget sound, often around the San Juan Islands and the Southern Gulf Islands. There are 22 members in the J Pod, which has been featured extensively in the news as of late. First for the mourning swim of J35, whose newborn calf died just after birth. She carried the calf’s body around for 17 days and over 1,000 miles. Just this month, the J Pod experienced another tragedy when Scarlett (J50) went missing after months of declining health. She is now presumed dead. The K Pod is the smallest of the Southern Residents, with 18 members, and the L Pod is the largest, with 35 members. Occasionally, all three pods get together for for a greeting ceremony known as a superpod. Here’s some video footage of a superpod filmed by Puget Sound Express on 9/13/2018. Transient orcas travel between Southern California to the Arctic circle. Unlike the Southern Resident Orcas, transient orcas eat mostly mammals — from harbor seals and porpoises to minke whales and gray whale calves. They travel in groups of between two and six individuals, but their family bonds aren’t as tight as those of the resident pods. 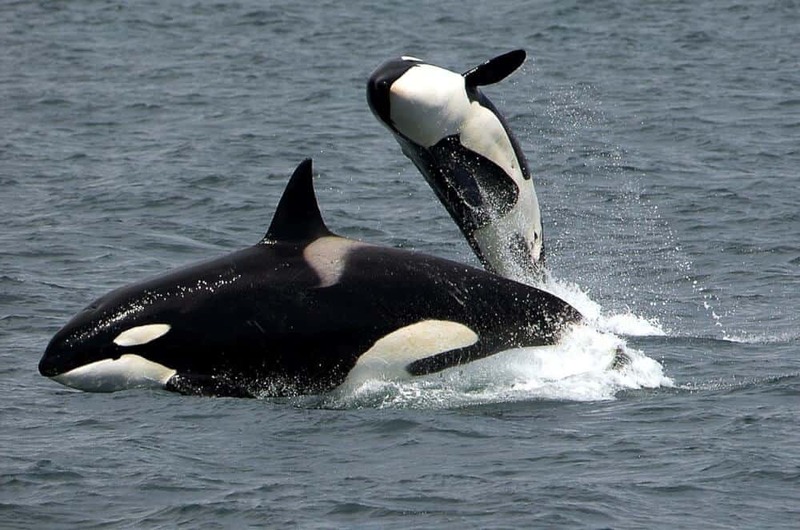 The transient orcas have a more pointed dorsal fin than the residents, and are also called Bigg’s orcas in honor of cetologist Michael Bigg. Transient Orcas are seen throughout the Puget Sound and Salish Sea, mainly during the summer months. The humpback is known for its distinctive surface behaviors, and are a treat to observe. As with the orcas, individual whales can be identified. Humpbacks feed in Arctic waters during the summer and migrate to tropical or subtropical regions to breed and give birth. They travel nearly 10,000 miles annually, and live to be 45 to 50 years old. Humpback whales are baleen whales, eating mostly krill and small fish. They have made a dramatic comeback to the Salish Sea in recent years, and are now seen in larger numbers. Like humpback whales, gray whales migrate from tropical regions north to polar waters each year. Many stop off in Washington’s inland waters on their way north. Adults range in length from 43 to 49 feet and can weigh up to 40 tons. Minke whales are elusive and small — the smallest of the baleen whales. They are widely distributed throughout the North Pacific and Atlantic Oceans. They feed in polar waters in the summer, migrating to equatorial areas to breed and give birth. Minke whales are often seen around the San Juan Islands. These are relative newcomers to the Salish Sea, and were first sighted by the Puget Sound Express in 2015. Fin whales are the second largest baleen whale, ranging in length from 60 to 65 feet and weighing up to 50 tons. The Puget Sound whale watching season runs from April through the end of September. Southern Resident Orcas are seen year-round, but most of the whales in the area are just passing through. Gray whales are best seen between March and May, as they make their way to their summer feeding grounds. 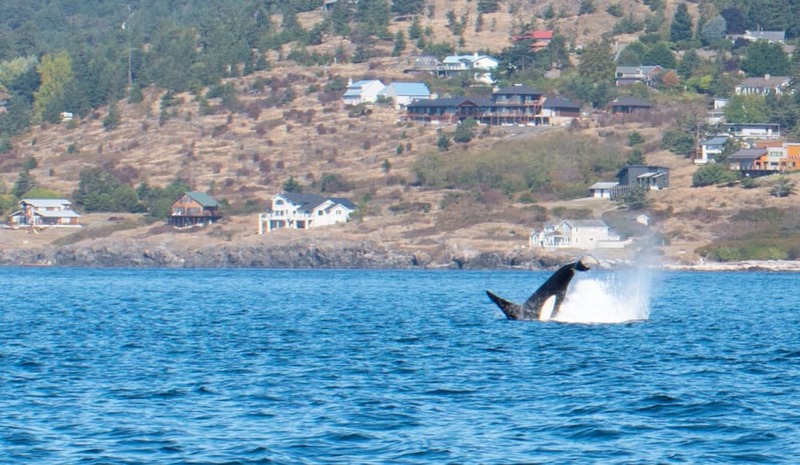 Transient orcas, humpbacks, minke, and fin whales are found in the Salish Sea from May to October. Puget Sound Express whale watching tours run until the end of October leaving from Port Townsend, and year-round from their Edmonds location. There are two types of porpoises found in the Salish Sea. The harbor porpoise is the smallest cetacean found in the Pacific Northwest. They are year-round residents with no distinct markings. Harbor porpoises eat many varieties of schooling fish. The Dall’s porpoise are high-speed swimmers who love to wake ride near boats. They are often mistaken for baby orcas because of their coloring and markings, and are only found in the North Pacific and adjacent seas. In addition to the whales that inhabit the Puget Sound and Salish Sea, you will likely see a fair number of seals and sea lions. Because the Salish Sea is is a frigid 49 degrees Fahrenheit year-round, sea lions must haul out of the water to warm up in the sun. They spend between eight and ten hours on land each day. California sea lions inhabit coastal waters from Mexico to Vancouver Island and are often seen on rocky shores and ocean buoys. Steller sea lions are larger and lighter in color than the California sea lions. The are frequently seen on Whale Island near the San Juans in large numbers. Sea Lions do not migrate, but will follow food sources from place to place. Harbor seals and northern elephant seals both live in Puget Sound and Salish Sea. Harbor seals are found along northern coasts of North America, Europe, and Asia, and are frequently found in small harbors, bays, and estuaries. Elephant seals migrate twice a year, from Mexico up to the Gulf of Alaska and the Aleutian Islands. While whales are definitely the big attraction on a Puget Sound whale watching trip, you should be on the lookout for other types of wildlife. 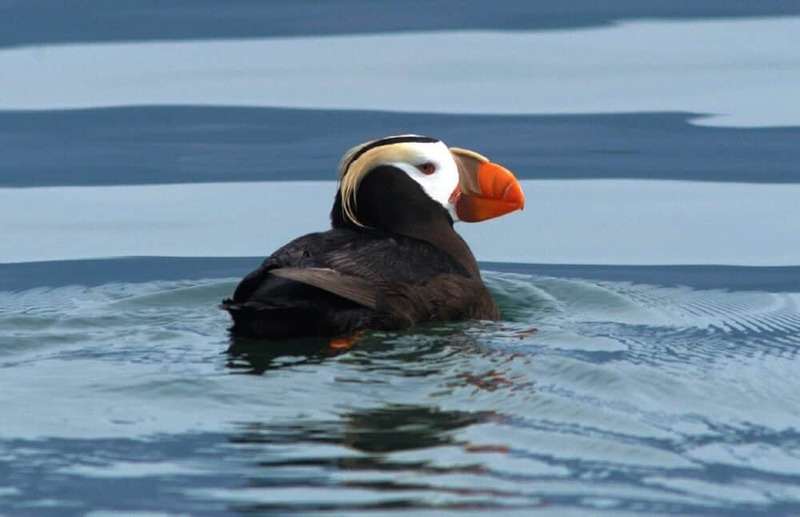 Bald eagles are common in the area, and the adorable tufted puffin breeds in large colonies on the Puget Sound. Also be on the lookout for pigeon guillemots, sandpipers, cormorants, harlequin ducks, and rhinoceros auklets. Hundreds of species of birds pass through the Puget Sound each year. There are plenty of whale watching tours in the Salish Sea, but only one that leaves from Port Townsend. Yes, we chose our whale watching excursion based on our location alone, but our decision was reaffirmed many times over. 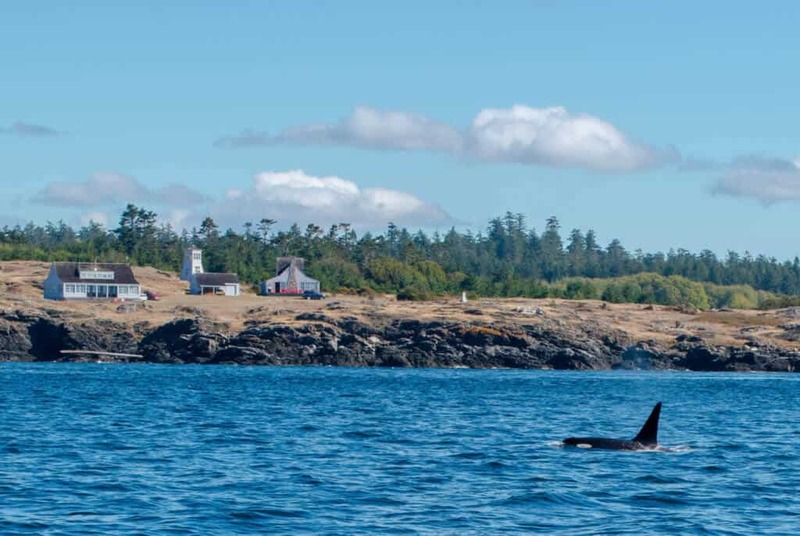 Most of the Puget Sound whale watching trips head out to the San Juan Islands because that is the most reliable destination to find orcas. The whale watching boats work collaboratively to locate whales for viewing. The Puget Sound Express Whale Watching tours leaving from Port Townsend are offered twice daily in the summer months. 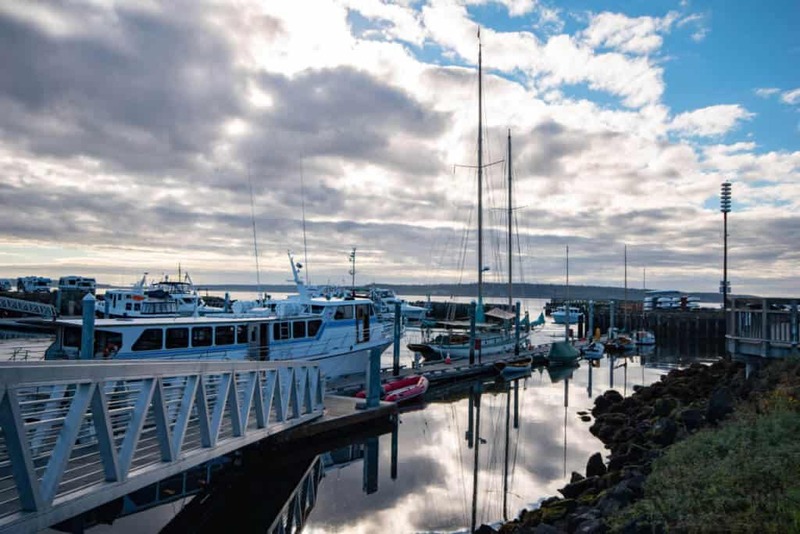 You can choose from a four-hour whale watching excursion, which leaves the Port Townsend Marina at 10 am or 2:30 pm, or a full-day whale watching trip, which leaves the marina at 9 am, and makes a two-hour stop in Friday Harbor. Port Townsend Express is the only company on the Olympic Peninsula that offers a day-long tour that combines whale watching in the Salish Sea with a port of call on San Juan Island. We chose the full-day whale watching trip, as I had never been to the San Juan Islands and loved the idea of lunch in Friday Harbor. We departed Port Townsend on a brisk September morning with just 15 people aboard the Glacier Spirit. The boat seats 70 people, and features comfortable indoor seating with huge windows for viewing wildlife. Because or trip wasn’t at all crowded, Rowan and I had a booth to ourselves. Wendy, the first mate of the Glacier Spirit, took drink orders, and suggested we try the famous blueberry buckle, which is made fresh daily. Don’t pass it up — it was so scrumptious. Wendy is also the ship’s naturalist, and is happy to answer questions about whales and other wildlife. Our Salish Sea whale watching trip was not the most prolific for whale sightings, but it hardly mattered because we saw orcas, which was my ultimate goal! On the journey from Port Townsend to the San Juan Islands, we spotted a few tufted puffins, some California and Steller sea lions, and lots of sea birds that I couldn’t identify. About two hours into the trip, our captain spotted a few distant orcas off the west coast of San Juan Island. We meandered along, keeping a close watch on the surrounding waters. Before long, we spotted a huge dorsal fin (like six-feet tall) coming out of the water. This was J26, otherwise known as Mike. Wendy explained that Mike, along with two females were foraging for Chinook salmon near the shore. The three orcas were very relaxed as they searched for food. Occasionally, they came close to the boat, and they even breached a few times. We spent about an hour with these Southern Resident Orcas before moving on toward Friday Harbor. What an amazing experience! If you choose the full-day whale watching tour, you will have about two hours to explore Friday Harbor in the San Juan Islands. 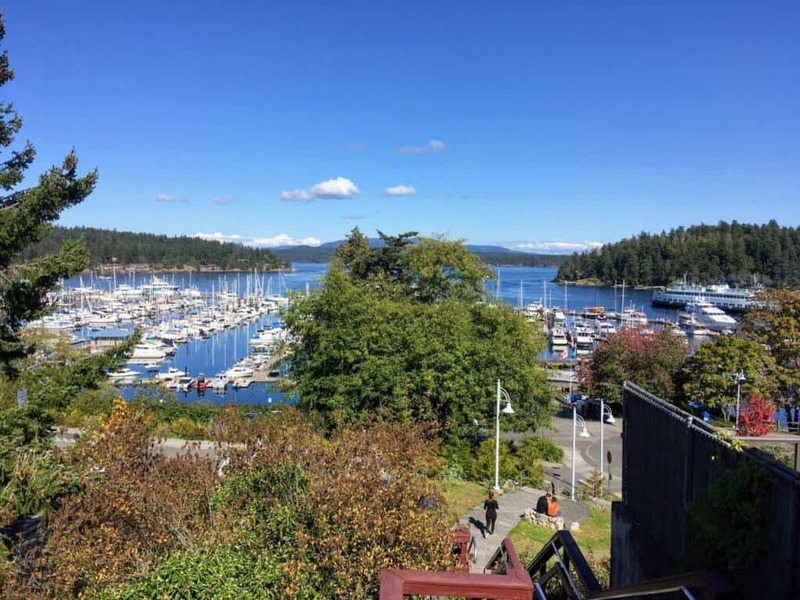 Friday Harbor is a small seaport with a bustling harbor, walkable downtown, and lots of shopping and restaurants. Although two hours isn’t really enough to explore the town thoroughly, you will have time for lunch, and a little meandering. Since you’re on a whale of an adventure, I’d definitely recommend the Whale Museum, which provides tons of cool information about the Salish Sea whales, and particularly the Southern Resident Orcas. While you could certainly spend a whole day at the Whale Museum, you can see most of the exhibits in an hour or so. The Whale Museum is open daily from 9-6, and costs $9 for adults, $6 for seniors, and $4 for students. Check out the video to learn more about this unique museum. There are lots of restaurants to choose from in Friday Harbor, and there’s a full binder of menus on the Puget Sound Express boat so you can figure out where you want to go before your port of call. We chose Market Chef on A Street, which features local seafood, fresh vegetables, and outdoor seating. Salads are sold by weight, so it was easy to sample just about everything from the deli case. A view of Port Townsend from the marina. After leaving Friday Harbor, we headed back to Port Townsend, looking for wildlife along the way. The trip took about two hours, and we didn’t see any more whales. In fact, a few of the passengers napped in their booths, others chatted and drank coffee, and only a few hung out on deck, as it was getting chilly. It was a beautiful ride, though, and we made it back to Port Townsed at about 5:30 pm. I was excited to explore Friday Harbor on our full-day trip, but if I were to do it again, I would probably choose the four-hour whale watching tour so I could spend all of that time looking for whales. We loved that the two-person crew on the Glacier Spirit were both so knowledgable about the local whales and wildlife. They were very friendly and always available to answer our questions. 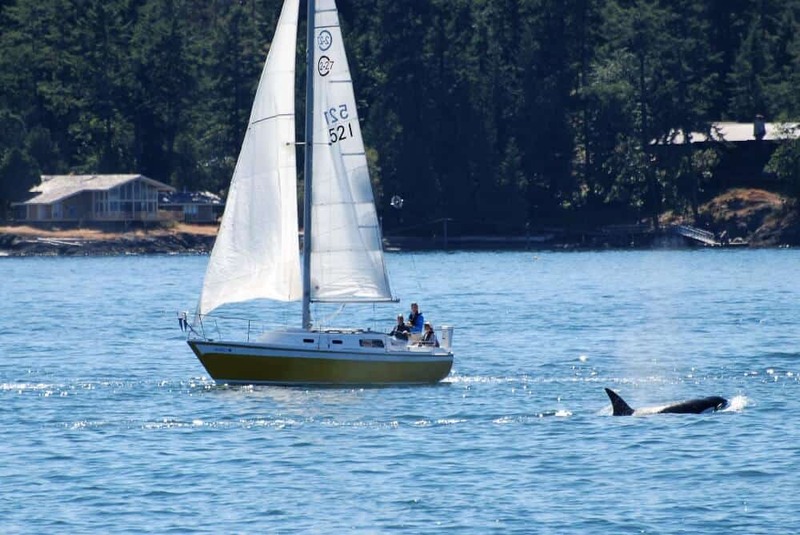 Ready to plan your own Port Townsend whale watching trip? There are a few things you should bring to make your experience more comfortable and enjoyable. Warm layers – Even in the summer, the Salish Sea can be windy and cold. I recommend packing or wearing several layers just in case. On our trip, I wore a t-shirt, a light-weight wool sweater, and a waterproof shell. I wore all three layers on the boat, but only wore a t-shirt in Friday Harbor. Sea sickness medicine – I don’t always get seasick, but when I do, it’s brutal. I chatted with the pharmacist a few days before our tour, and he recommended Bonine, which doesn’t make you as drowsy as Dramamine. A camera – There were all types of photographers on board — some using their phones, and some with expensive DSLRs and huge zoom lenses. I brought my Nikon D5500, and several lenses, but I ended up using the 55-300mm lens the most. I forgot my polarizing filter, but if you have one, I’d recommend it. 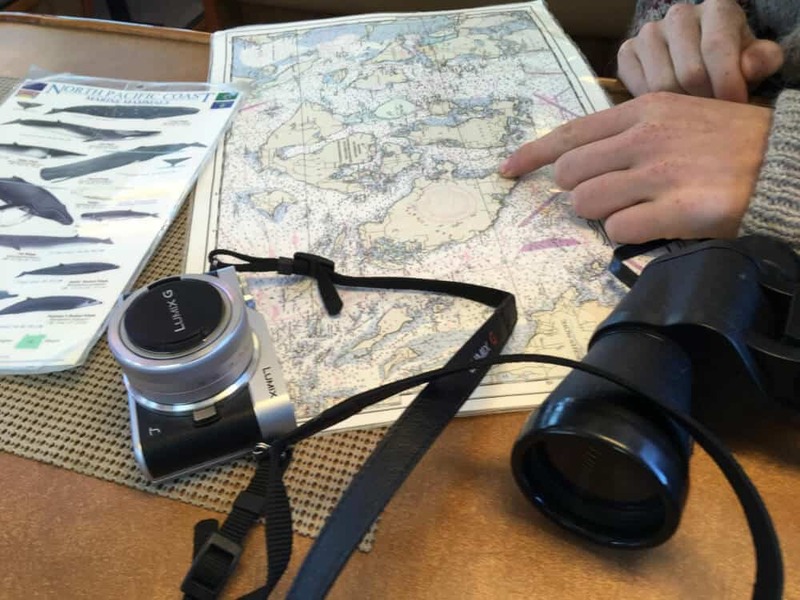 Field guides – We brought Whales and Other Marine Mammals of Washington and Oregon with us. We found it very useful. There is also a binder on board the Glacier Spirit that identifies the Southern Resident Orcas, which was really cool to look through. Water – There are drinks for sale on the boat, but we brought our own water bottles. Warm hat – A wool hat was definitely appreciated. Make your reservations early – Stop in or call Puget Sound Express to make your reservations. A few days ahead of time is usually sufficient, but if you are visiting in high summer, you may want to reserve a spot several weeks in advance. Arrive early – Generally, you should arrive a half hour before departure. Your tour will be cancelled if there aren’t enough people or the weather looks bad. Buy the coffee mug – You can buy a souvenir coffee mug aboard your Puget Sound Express boat for $5, which gives you free coffee for life on whale watching adventures. 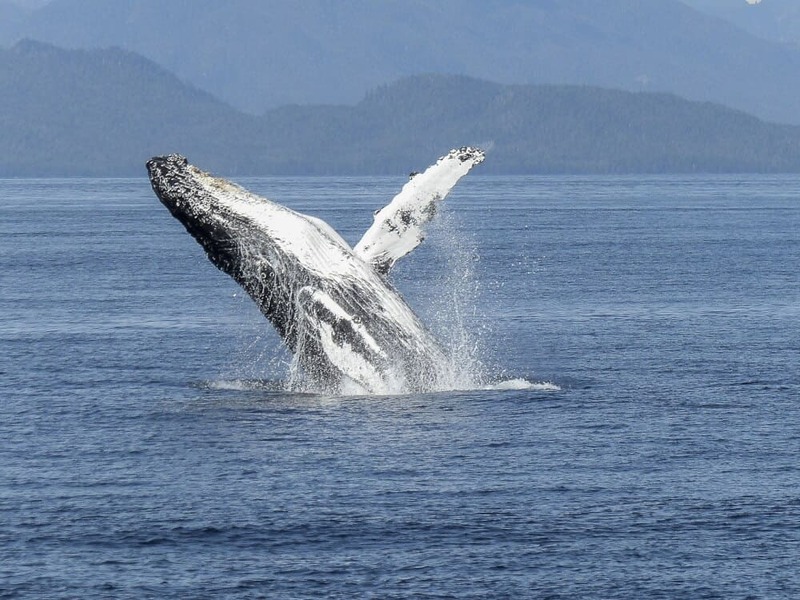 Be mindful of your cell service – While whale watching in the Salish Sea, your boat will travel very close to Vancouver Island. To avoid roaming charges on your phone, set it to airplane mode. Consider overnighting in Friday Harbor – You can make special arrangements to ride the boat over to Friday Harbor one day and come home on a different day. I wish I had known this before our trip. I would have loved to spend more time in Friday Harbor. There are lots of places to stay. We have great luck finding deals on Trivago. Visit Port Townsend – We are lucky that our son lives near Port Townsend, and we visit at least once a year. 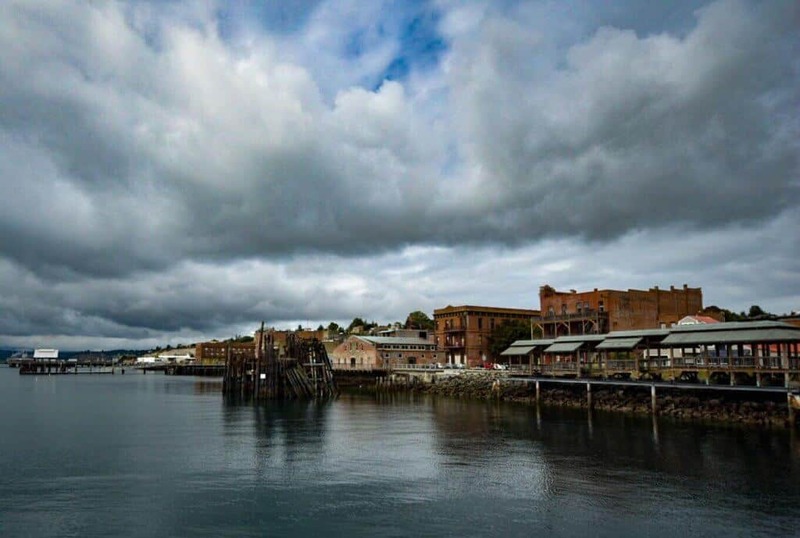 We’ve got a few tips for visiting Port Townsend on the blog, but you should also check out Enjoy Port Townsend for lots of info for dining, lodging, and events, and PT Guide for up-to-date event info. Where is your favorite spot to go whale watching? We’d love to hear about your trip in the comments below.